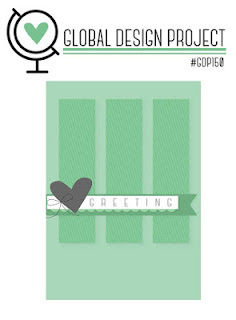 I love the three strips in the Global Design Project challenge. I was trying to figure out what I was going to make with the challenge. I went through my stamp collection and found the wine glasses from the Half Full stamp set that worked perfectly for the challenge. I ended up tweaking the sketch and making it my own. The best part of making this card was that I was able to use the notches on the Stamparatus. You can actually move the boards over one notch at a time. 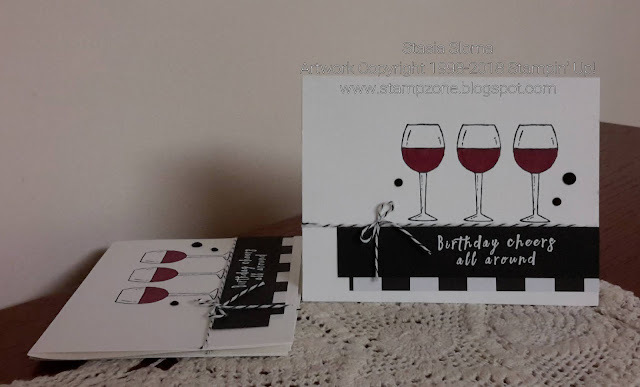 This was just perfect to line up the wine glasses without reattaching the wine glass every time to the board. I to say this was one of the things that sold me with our stamp board. I have used the other boards on the market and none of them can do this. It is a must have. The wine glasses were colored in with a Chameleon markers. The sentiment comes from the Perennial Birthday. The finishing touches was a Pop of Pink specialty designer series paper, baker's twine and faceted dots. I love this card, very eye catching. Great work Stasia!